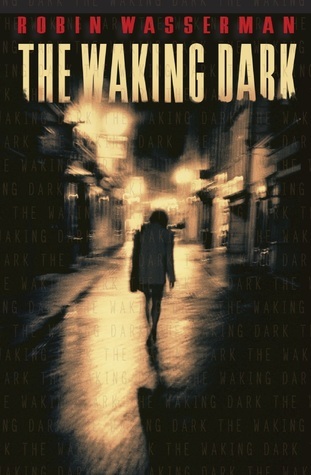 The Waking Dark by Robin Wasserman. Knopf, 2013. Currently Available. Face Value: While this isn’t exactly a cover that I tried to read in public so that people would be intrigued by it, it’s a perfectly acceptable cover for this book. Nothing embarrassing and it looks appropriately frightening to reflect the story inside. Does it Break the Slate? It does. One of the things Wasserman does best here is craft a cohesive story from multiple narrative points, and her protagonists feature a wide variety of very different young men and women. She also challenges assumptions about virginity, sexuality, and what it means to be a “good” girl. Who would we give it to? I’ve heard this compared to Stephen King’s Under the Dome, which I have not read. So I can’t speak to that comparison. But if you want something creepy and unsettling and suspenseful, then you will probably like this! There’s a distinct horror vibe blended in with some of the more traditional contemporary dystopian elements. Review: Oleander, Kansas is your typical small town. High school football and religion get shared top billing on everyone’s priority list, except for those who are more devoted to meth. Everything is boring and normal, as it should be at the outset of a horror novel. And then one day, five people, nice, normal people, kill everyone around them and themselves. Twelve people are dead and only one of the murderers is still alive. A year later, the impact of the Killing Day, as it becomes known, becomes even more insidious than anyone had realized. Cassandra, who was a popular, well-liked girl, dating West and beloved by Daniel until she killed the infant she was babysitting. With no memory of the event, she is the only one of the killers to survive. We hear from all five of these characters, and more as the town descends into total chaos. The build up is incredible. I was legitimately scared and on the edge of my seat as the events of the Killing Day unfolded, as the even more creepy events of the following year began to unravel. The downside, however, is that the reason behind all of the mystery (while totally horrifying, don’t get me wrong), is revealed a little too easily. Having everything basically expositioned out by a conveniently discovered doctor just seemed surprisingly simple, given the complexity of the build up. That said, the truths that were uncovered there are pretty horrifying. And I’ll give the writer credit again for being totally unafraid to kill off her characters. Outside of the plot, these characters are all fascinating, and richly developed. Given that we don’t get to spend that much time with any of them, it’s impressive that we have relatively comprehensive character portraits. And, as I mentioned, Wasserman does a nice job of complicating gender stereotypes through the different characters’ identities, whether it is West coming to terms with his sexuality, Jule trying to establish an identity for herself outside of the expectations of her family or Ellie trying to reconcile the things she has done with what she has always been told is evil. Each character turns out to be more complicated than originally presented. Another thing that is fascinating is that, while there are certainly actual evil forces at work here, all of that evil is basically compounded by things that are already major parts of the towns life. Fanatical religion and drugs, already deeply embedded into this community, fuel the horror of what plays out over the course of the book. Horror is not a typical genre that I seek out, but I really found myself enjoying this read. If you’re looking for something creepy to read for Halloween, you won’t be disappointed with this offering. This entry was posted in Reviews, Young Adult and tagged Death, Dystopia, Horror, Small Town, Violence. Bookmark the permalink.